Rookie Mistake Taleisin - Adventure Machine! With the weather turning and the anchorage getting less comfortable we decided to find a better spot. We spent the last few days carrying water back to Taleisin. We did it the hard way, we carried 20 Litre water cans back and forth for a total of 4 trips. We rowed back and forth and loaded it all on board Taleisin. Yes we probably could have motored up to the dock and done it all very quickly. That all sounded too easy so we did it the hard way. We got some good exercise and I’m sure we’re better off because of it. We soon had the anchor weighed and started to slowly sail. Annie said, I think we’re actually moving backward. No problem I’ll hoist the stays’l. With the stays’l up we were going in the right direction! Great, we sailed off the anchor again. This time in a bit more breeze than before. We didn’t even start the engine so we felt pretty good. We were short tacking up the harbour as the wind was on the nose. It was a bit of trial and error as we have to backwind the stays’l to ensure that Taleisin brings her nose around properly. It probably didn’t look to good from the shore side, but we didn’t care. We were sailing out of this anchorage when most were motoring. I’ll take that as a small victory. We had, what I thought, a clean line to sail out of the harbour. 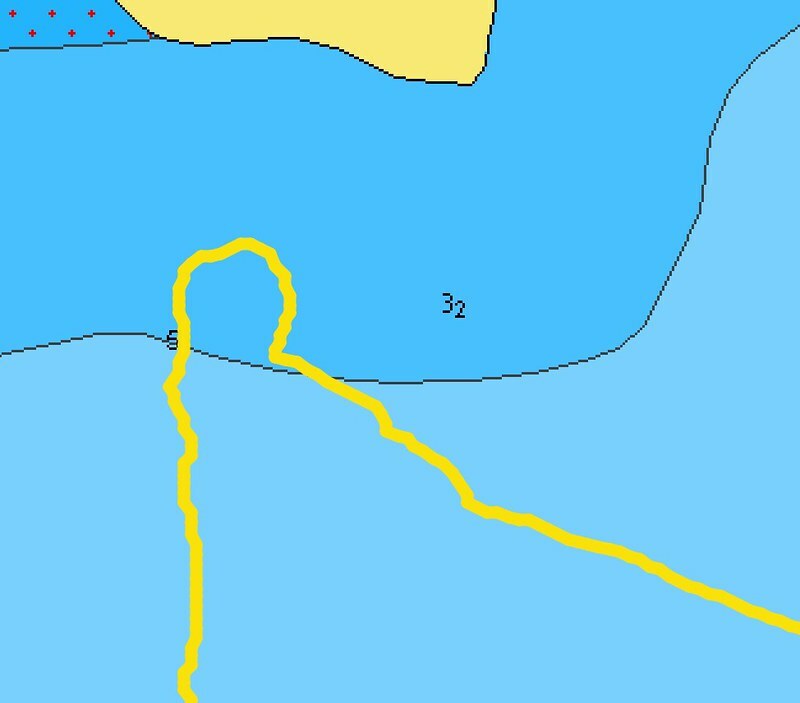 So I kept the course I was steering. Then things changed a little and I recall saying to Annie. We’re too close to the headland, I don’t like this one bit, lets tack. We attempted to tack. Taleisin would come around and then all of a sudden just fall back. Something wasn’t right! Not too worry, we have room so we’ll try it again. This time with more speed. Taleisin comes around and then just falls back. Ok, we’ll try again this time more speed and give the helm all she’s got. Now we’re getting a little tense, this same thing happened. Annie did suggest that we gybe or start the motor, I jumped, started the motor in what some might call a bit of a panic, and opened the throttle. Helm hard over, Taleisin finally comes around! A huge sigh of relief, adrenaline rushing as we knew it was close. You can see in the closer zoom the 3 attempts at tacking. Then the loop as we motored around. As I looked back from the turn I said to Annie, that was way too close for my liking! We made it out of the harbour without any further drama. It wasn’t exactly a calm day out there, so we looked at each other and decided that it was enough adventure for one day. 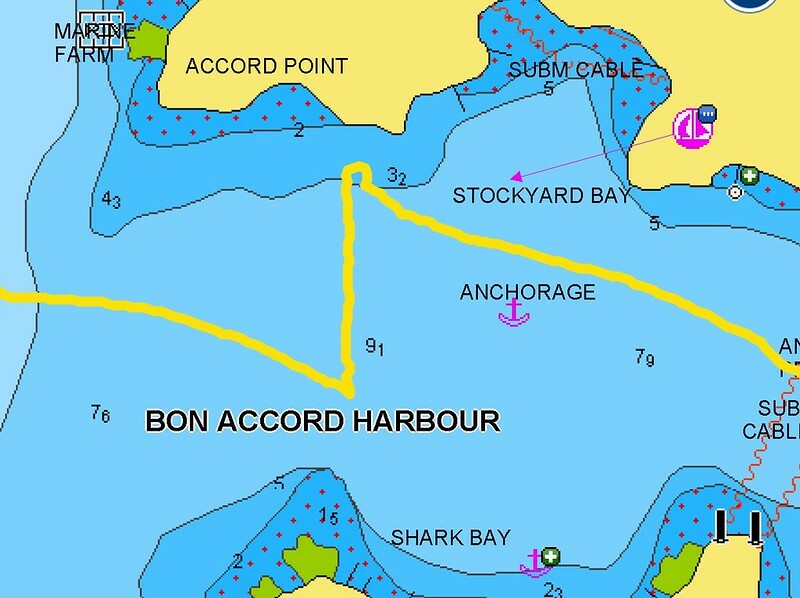 Rather than proceed to the anchorage we planned on, we’ll turn tail and run back to North Cove. We sailed into North Cove and attempted to pick the mooring up under sail. We were tracking slowly enough until we turned the corner and the wind picked up and we sped past the mooring. Rather than persist I agreed with Annie that the best course of action would be to just used the outboard and chicken out. The motor was already running at this point so we only had to put it in gear and open the throttle. We motored around and attempted it again. This time coming in slowly with the wind on the beam. We didn’t quite make it as the wind blew the bow off. Ok lets try that again. Again we motored around to try the same thing again this time steering a little higher. It’s madness trying the same thing over and over again expecting different results, never the less we’ll give her another go just in case we didn’t learn the first time. Same result! Ok we’ll go round again. Wait! What? This is madness! I turned Taleisin hard around and slowly allowed the wind to blow us onto the mooring. I had to put the motor in reverse to get us positioned just right. Success! We’re now safely secured to the mooring. It’s gusting up to 20 knots out there, we’ve had time to re-evaluate the situation. The adrenaline has worn off. Annie busy cooking us a nice meal. Bottom line: Nobody got hurt, nothing go damaged (except maybe my ego), everything actually worked out in the end. We’ll take this lesson on aboard and go try again when we’re rested and ready for more adventure. It’s easy to overlook the good. We had a few things that we managed to do without any drama. There was only really one major drama. We might try again tomorrow!